William Munford was a country clockmaker whose name is little known. He worked at Helmsley in North Yorkshire. Those few reference books that mention him have him as Mumford, an error probably arising from an incorrect reading of a name on a tarnished or discoloured dial. In fact it is only recently that we have discovered that his name was Munford and not Mumford. I have heard of only three or four clocks by him in over forty years of recording such things, and the best idea we had of a date was an estimate of around 1750. Then, just recently, the clock pictured here came to light, and what an extraordinary clock this is. William was born in Helmsley in 1738, the son of another William Munford, who might also have been a clockmaker - we cannot say as trades are not specified in the parish register. William junior married there in 1764 to Frances Smith, and they had three daughters baptised there in the 1760s. That is as much as we know about his life. 1. The ten-inch dial with his signature, overlaying the W for William on top of the M for Munford, a feature which leaves the name open to misreading. Original single hand. Unusual spandrel pattern. I was very pleasantly surprised when I came across the clock pictured here, which is very unusual and strongly indicates those aspects I always refer to as clocksmith work. Clocksmith is a word, which is no longer in the dictionary but which was much used in the eighteenth century to mean a smith (probably a blacksmith but could be a whitesmith), who also made clocks, rather than a full-time clockmaker. A blacksmith sold iron goods 'in the black' as it was termed, that is usually wrought-iron goods of a heavier nature such as gates, which were supplied painted or japanned black against rust, being probably intended for outdoor use. A whitesmith sold iron goods usually of a lighter nature and polished brightly, or 'in the white', perhaps meant more for indoor use. Oddly enough although we all know the word 'blacksmith', practitioners of that trade today are a rare breed. The implication with clocksmith work, as opposed to that of the clockmaker proper, is that it might contain a high proportion of ironwork, not only because smiths excelled at working iron, but because iron was much cheaper than brass, about one tenth of the price. A clockmaker who used more iron kept his manufacturing costs lower and could sell his product more cheaply. A cheap price was especially important in rural areas where not only were incomes low, but for those who worked in agriculture, whose lives were governed by the available hours of daylight, a clock was likely to be the last thing on their list of requirements. What need had a farm worker for a clock, when he knew the time of day by instinct? To tempt him the clocksmith had to price low. What is more farmers were notorious at wanting to bargain till a low price was achieved, and the clocksmith who cut his costs had room to manoeuvre. Many rural clockmakers were really clocksmiths, turning their hands to mending, or even making, any kind of machinery, anything made of metal. A measure of one term against the other is exemplified in my mind by the two well-known makers of clocks, the Jonas Barbers of Winster in Westmorland, father and son. When the father died in 1764 he called himself a clocksmith in his will. In 1802 when the younger Barber died, he referred to himself in his will as a 'clockmaker'. The distinction in their minds was often that a clocksmith was a blacksmith who taught himself clockmaking, whereas a clockmaker was instructed in that skill from scratch, very often by an apprenticeship. In the case of Jonas Barber junior he was instructed in what was usually termed the 'art' of clockmaking by his father, who was a clocksmith! William Munford's work shows certain features we expect of a clocksmith, in particular an abnormal amount of ironwork in the round rod pillars, which were not only cheaper to make than the normal cast brass ones, but involved a lot less work. Any blacksmith could make round iron rod, or perhaps could even buy it in ready made. But the fascination of clocksmith work for collectors is that such men often had a style of clockmaking which was unique to themselves, doing things in their own, often perverse, way. This means we are looking at individual hand craftsmanship, which may often enable us to distinguish that particular maker's work from that of any other, even any other clocksmith. 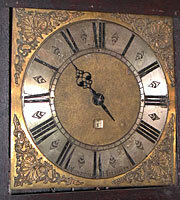 The classic case is, for instance, clocksmith Will Snow of Padside, Yorkshire, whose clocks have delightfully eccentric skeleton movements, unlike those of anybody else in the land, though clocksmith Henry Mason of Egremont in Cumberland also hit upon the same cost-saving idea of making skeleton plates, quite different skeleton plates from Will Snow though. 2. The plain oak case, simple, rustic, but of an excellent colour and patina. So with this clock William Munford did not let us down in our expectations. His clock plates are unusually narrow and arched in shape - another economy . By not using the usual rectangular shape he has saved that amount of brass which would have continued from the plate shoulder to the top at each side - quite literally cutting corners! Such savings in brass were important. I once weighed the brass content of a clock by Will Snow and compared it alongside that by a more traditional clockmaker. The resulting saving in cost amounted to a day's wages. The fact that William Munford's plates are arched ones also probably means that he cast his own, because you certainly could not buy such castings 'off the peg' from brassfounders who regularly supplied clockmakers with their castings. Even more evidence of their being his own castings is that they have a reddish, coppery colour, rather different from the normal yellow brass of the day. The colour difference is very pronounced when seen against the much yellower colour of the locking plate in plate 3, which was presumably a casting from a regular supplier. But even more amusing is that the front plate obviously had a casting fault just inside the shoulder of the right-hand arch (as seen in our view from the back). We know that because there are signs that the corner was insecure or perhaps even broken away, right at the point where the dial foot attached. It may even be that pressure from the dial foot attachment caused this flawed section to break off. We can see tiny holes drilled into the thickness of the plate, where holding pins have at some time been used to strengthen this weak point. But even they failed to hold it, and this corner finally broke away and was lost and is now completely missing. The last repairer of this clock has made do by tapping his dial foot retaining pin directly into the thickness of the brass plate, using a hole once made to hold the loose corner piece in place - there is nothing else to fasten it to! Arched plates are extremely uncommon. I doubt if I can think of three makers who used them. The best-known one, who comes to mind is Thomas Ogden of Halifax, a highly-respected maker of the finest quality clocks, and the exact opposite end of the spectrum from William Munford! But Ogden used arched plates to make his clocks better than anyone else's, not cheaper, having unusually large plates and going to the trouble and cost of arching them just to show off with. Ogden, who catered for the top end of the market (his obituary explained that 'a great many gentlemen's houses being furnished with the productions of his labours'), could afford to use arched plates, which were wasting brass. Munford used arch plates to save brass. 3. 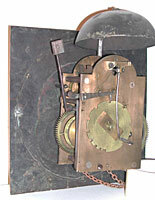 The movement from the right shows the three-part construction of the dial, the parts held together by rivets. Note the iron, round-rod pillars. But there is something even more 'clocksmithy' about this clock of William Munford's, something I don't think I've seen more than once or twice before. His dial centre is riveted to the chapter ring, which in turn is riveted to a surround (the four corners held together by a thin joining strip, but in a single casting). In other words there is no continuous dial sheet as such. Nothing is holding the dial together but the rivets fastening one piece to the next to the next. Not good engineering, not regular 'clockmaking' practice, but good clocksmithing - and the proof that it works is that it still holds together over two hundred years later. In general southern dial sheets were solid, northern ones often of 'cartwheel' design, but William Munford has used no dial sheet at all, just those sections of dial sheet (a centre, a chapter ring and a perimeter) which he needed to hold everything together. The result is flimsy, for the surround (corner) casting is thin and relies on its grip on the somewhat thicker chapter ring for strength. So William Munford is cutting corners, but there's more to it than that. Not only is this eccentric dial further proof of his individual 'craftsmanship', but he must have cast that surround himself, or had it specially cast, as it is not regular practice and such things cannot have been available to purchase. All this is unusual enough, but what to my mind makes this clock even more entertaining, is that by chance an article appeared in Clocks Magazine a while ago about another longcase clock by this very maker, written by Ian Beilby and published in the issues of November and December of 2002 and January of 2003. Ian has been kind enough to loan me a couple of his photographs to use here for comparison. The movement of that clock appears to be absolutely ordinary, just like those made by hundreds of other rural clockmakers throughout the land. For that clock William must have bought in standard castings! It's all very strange. Did he find it was too much trouble to make his own castings and forgings? Was it just easier to buy in standard parts, cast by a brassfounder and that didn't have casting faults in them? It certainly cannot have been cheaper to buy them in. But maybe if he was busy, and had not time to make his own ....? Or perhaps he cast his own plates in his earlier days he was struggling, and opted to buy them in later when he was well established or less cost-conscious. We never know the answer to half the questions which face us in pursuit of our obsession with old clocks. That's probably what keeps it interesting. But at least our study of their work throws up a constant new batch of questions for us to keep asking. These old clockmakers (or even clocksmiths) didn't bother to write down what to them was just everyday stuff. If they are looking down at us from 'up there', they must be splitting their sides. They could never have dreamed that two hundred years on a sad bunch of obsessives would be scratching their heads in pondering over what might just have been a Monday morning job done through the haze of a hangover brought on by too much church wine.